I hope you enjoyed the first part of this blog post, sorry it was a little long, but for those of you, who, like me, have practised Ju-Jitsu in the U.K., I think it's important to understand where the fascinating art we choose to spend our time studying comes from. However, equally as important (in my opinion) is "how" it got here, specifically to the U.K. and even more specifically for my students and those from the World Ju-Jitsu Federation in the U.K, how it got to Liverpool. So one day, after a Tuesday morning training session, I asked him....and so began a conversation lasting around an hour which truly fascinated me and inspired me to read and research more, the results of this form part 2 of the blog post "A History of Ju-Jitsu", enjoy. PART 2: JU-JITSU ARRIVES IN THE U.K.
Whilst fundamentally important to any students understanding, for me personally, the history of Ju-Jitsu in Britain holds more interest and relevance as it is this very history which I am now a part of. Britain was one of the first western countries to receive Ju-Jitsu instructors. The first recorded demonstration took place in March 1892 at the inaugural meeting of the Japan Society, by a Mr. Shidachi. 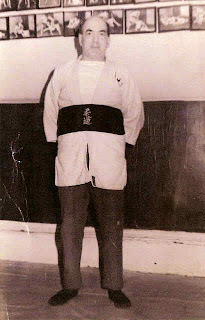 Mr. Shidachi, like many of the Japanese living in London at the time had trained in Ju-Jitsu in Japan and was no doubt an excellent and highly skilled practitioner, however it’s important to note that he was not a proclaimed Ju-Jitsu instructor, in fact he was a secretary at the London branch of the Bank of Japan. 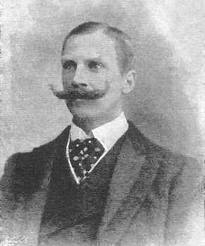 Some 8 years later, Mr. Barton-Wright, who had lived and worked, like many Westerners as an engineer in the new “industrial” Japan and had trained in Ju-Jitsu in Tokyo, returned to Britain. He demonstrated his Ju-Jitsu capabilities (which he referred to as “Bartjutsu”) and also wrote to his Japanese instructors Master Yukio Tani and his brother, inviting them to Britain to form an academy of Ju-Jitsu. Early demonstrations by the Tani brothers and their associates who arrived with them we’re unfortunately badly managed and did not give the Japanese the opportunity to showcase the true value of the art against the more commonly seen wrestling, boxing and circus strongman. The disinterest lead to a number of instructors returning to Japan, with the exception of the Tani brothers, who did not give up. To promote the art of Ju-Jitsu, Mr. Barton-Wright decided to tour the country showing the art of Ju-Jitsu and placed challenges to all comers to defeat the Japanese Tani brothers. Yukio Tani was at the time, only a young exponent of Ju-Jitsu and a natural showman. He led the two men into touring the Music Hall circuit across the UK. Yukio Tani would challenge anyone willing to test his skill against him and with the temptation of winning £1 for lasting each minute, or £5 for winning, there was never a shortage of challengers. Despite being only 5 feet 6 inches (1.67m) Tani allegedly lost only one music hall match and that was not to a British contestant but to a fellow Japanese national, Taro Miyake in 1905. 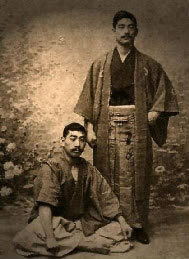 In 1900 Yukio Tani’s brother returned to Japan and a new name appeared on the music hall circuit, Sadukazu Uyenishi, who used the stage name "Raku" but soon he moved into teaching self defence and physical education at the Army Gymnastic HQ in Aldershot after word of the skill of these men reached the military ranks. Tani split from Barton-Wright in 1903 and in 1904 he opened the Japanese School of Ju-Jitsu at the Anglo-Japanese institute in London with Sadukazu Uyenishi. It was at this institute that a Mr Jack Britten, a London born boxer who earned money fighting in the boxing booths around the city came into contact with Ju-Jitsu under Yukio Tani, and Sadakazu Uyenishi, and other Japanese who stayed in London whilst in transit to other European capitals. Jack became a highly proficient student of Tani and Uyenishi but was eventually called up to fight in the First World War from 1914- 1918. With the end of the war in 1918 Jack eventually returned to London looking for work. Sometime in 1921 he came to Liverpool and opened a pet shop in Smithdown Place, above which he established a small Ju-Jitsu School. Later in the 1930s he moved to Shiell Road, Kensington, Liverpool, taking over a very large house that had 5 rooms, rooms he converted into matted dojos calling his school the Alpha School of Ju-Jitsu. When I first heard of the Alpha School of Ju-Jitsu, it did not mean a great deal to me, that was until I became old enough and experienced enough to ask my instructor, Soke Robert Clark where “our” Ju-Jitsu came from. 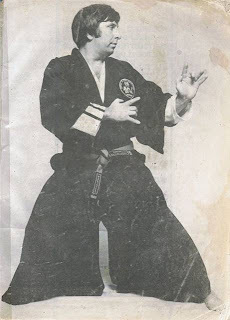 Soke Clark explained that The Alpha School of Ju-Jitsu was considered to be THE best martial arts school outside of London, this was due to the superiority of Tani and Uyenishi’s teachings, passed on to Jack Britten. One of Jack Britten’s most famous students was who we now know as Soke Robert Clark who developed the first recognised syllabus of Ju-Jitsu outside of Japan and later joined forces with other Ju-Jitsu students Richard Morris and James Blundell to form the British Ju-Jitsu Association. James Blundell’s journey in Ju-Jitsu follows a similar pattern (all be it, there are less details available) in that he was taught by a man named Harry Hunter who studied in Japan whilst stationed there with the British Navy and opened his own school upon returning to the UK where his most senior student, named William Green in turn taught James Blundell. Mr Clark, later sought to establish Ju-Jitsu across Europe with the help of Richard Morris and The World Ju-Jitsu Federation was born with The British Ju-Jitsu Association (BJJA) being its British Branch. With particular interest generated in Italy, Ju-Jitsu found a second home and one of Mr Clark’s students and a fellow martial artist Giacomo Bertoletti became the president of the WJJF. 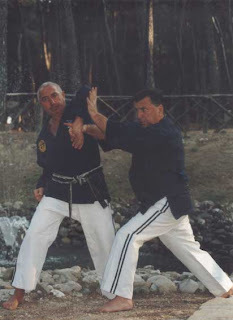 Eventually, the WJJF and BJJA split (the reasons for this are not documented and not for discussion here) and the WJJF under Mr Clark grew to an international organisation, with clubs existing now in over 72 countries and the famous blue jackets linking together thousands of black belts around the world, with the International Headquarters still based, as it has been since it's formation, in Barlows Lane, Fazakerley, Liverpool. Hello, welcome to the CJJA blog! !